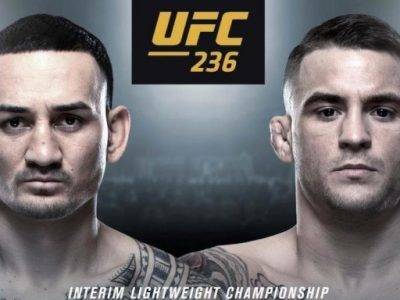 Max “Blessed” Holloway (20-3) fights Dustin “The Diamond” Poirier (24-5) in a UFC Interim Lightweight Championship bout at the State Farm Arena in Atlanta, Georgia on Saturday 13th April 2019. Holloway has won his last 13 fights and is coming off a December win over Brian Ortega, when a doctor was called to put a stop to the fight at the end of the 4th round. It was a near flawless performance from Holloway, as he controlled the fight’s distance and prevented any opportunities Ortega had at takedowns. He also landed multiple shots on his opponent and showed that he could take a punch himself as Ortega landed some clean strikes. Holloway is now definitely rated among the top echelon when it comes to any arguments about the best ever pound for pound fighters. Nobody has yet been able to beat Holloway on his feet. Poirier has won five of his last seven fights and is coming off a July 2018 win over Eddie Alvarez. He’s also beaten two incredible strikers in Justin Gaethje and Anthony Pettis in that run. Of Poirier’s 29 fights, only seven have gone to a decision and he has the psychological advantage of having beaten Holloway in the past. The problem is that was way back in 2012. If Poirier can secure a repeat win against Holloway, he could be in line for the biggest pay day of his career, with potential fights against the likes of Khabib Nurmagomedov or Tony Ferguson on the horizon. In terms of UFC betting predictions, Poirier totally dominated Holloway on the ground with an armbar and a triangle choke seven years ago and getting him on the ground is where he could have the advantage again on this occasion. Max Holloway is a much more polished fighter these days though so, although there is some appeal on Poirier at odds of +180 at bet365, the betting line on Holloway at -220 also at bet365 has to be the tip here.